Previous research on long distance romantic relationships (LDRRs) has tended to focus on the two people that make up the couple. With the advent of LDRR online communities, however, there is a need to expand the analysis to include larger social structures. Currently little is known about how and why individuals who are in LDRRs use LDRR online communities and what effect participating in this kind of public online space has on maintaining LDRRs. In this paper, we introduce a popular Chinese LDRR online community, the LDRR public page on Chinese Facebook, Renren, and report exploratory interviews conducted with users of this community to understand their behaviors and motivations for using it. 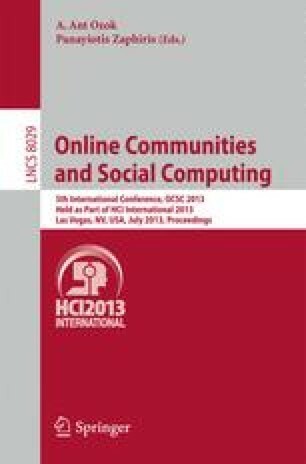 We found that: 1) users lurk most of the time unless their strong empathy is aroused; 2) users’ four major motivations are belonging, empathy, social support, and learning; 3) initial and continued motivations have different patterns; 4) perceived social support is the main benefit of participating in the LDRR public page.